Palagruža (pronounced [palǎɡruːʒa]; Italian: Pelagosa) is a small, remote Croatian archipelago in the middle of the Adriatic Sea. It consists of one larger island, called Vela or Velika ('Great') Palagruža, and a smaller one, Mala ('Little') Palagruža, as well as a dozen nearby rocks and reefs composed of dolomite. All the main islets are in the form of steep ridges. The place is some 123 km (76 mi) south of Split, Croatia, and 53 km (33 mi) east of the Gargano peninsula, Italy. It is visible from land only from other remote islands of Italy and Croatia. Palagruža is further south than the mainland peninsula of Prevlaka, making it the southernmost point of the Republic of Croatia. It is uninhabited, except by lighthouse staff and occasional summer tourists. It can be reached only by a chartered motor-boat, requiring a journey of two to three hours from the island of Korčula. The place is known in Italian as Pelagosa, derived from Ancient Greek Pelagousae (Πελαγούσαι, 'sea'). This is the source of the current Croatian name, as well as of the name of pelagosite. Gruž also means 'ballast' in Croatian, and the term is therefore well known in two ways to seafarers. For some, Palagruža is associated with the Homeric hero Diomedes, king of Argos, who is reputed to be buried here, though it is hard to imagine where. Speculation is fuelled by the discovery of a painted 6th-century BC Greek potsherd with the name Diomed[es] on it (see image on Adriatica). A shrine of the cult of Diomedes here is perfectly thinkable. Authentic archaeological finds of the Neolithic, Greek, Roman, and early medieval periods have been recorded. It is reliably recorded that the galley-fleet of Pope Alexander III landed here on 9 March 1177. In the 15th and 16th centuries, there was a rise in fishing in the area, making the island the centre of a traditional fishing-ground of the community of Komiža, island of Vis, Croatia. Palagruža is closer to Italy than to the Croatian mainland, being some 42 km (26 mi) from Monte Gargano. Before 1861, it belonged to the Kingdom of the Two Sicilies, and after 1861 therefore to Italy, but was unilaterally occupied by Austria-Hungary in 1873, without any declaration of war. The first action of the new authorities was to build the important lighthouse mentioned above, in 1875. After Italy's entry into World War I, the country's armed forces occupied the island. The Italian Navy submarine Nereide was sunk there on the 5th of August 1915 by the Austro-Hungarian Navy's submarine U-5. 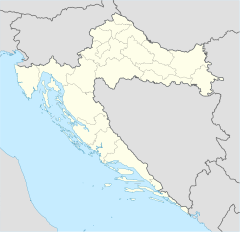 It reverted to Italy between the two World Wars, as part of the Province of Zara (now Zadar, Croatia), and was ceded to Yugoslavia in 1947. Since the break-up of Yugoslavia, it has formed part of the sovereign country of Croatia. Palagruža sits in the heart of fish-rich seas, including spawning grounds of sardines. It is a nature reserve, and the small amount of vegetation is of the Mediterranean type, for instance oleander (Nerium oleander) and tree spurge (Euphorbia dendroides). There are endemic plant species including a type of knapweed, Centaurea friderici Vis. (Palagruška zečina ). The algae, and their role in the production of the local mineral pelagosite, have been the subject of academic study (Montanari et al. 2007). The distinctive local fauna, including the black lizard now classed as Podarcis melisellenis ssp. fiumana and the related Podarcis sicula ssp. pelagosana (primorska gušterica in Croatian), was mentioned first by Babić and Rössler (1912). Velika Palagruža is an apical part of subsurface geological complex, composed of carbonate, siliciclastic and evaporite rocks of different ages, ranging from Triassic (approx. 220 mil. years ago), through Miocene (approx. 10 mil. years ago), to Quaternary (recent deposition). Palagruža has a weather station, established in 1894, which represents a major indicator of weather, especially wind, waves and precipitation on the open Adriatic. Weather conditions on the central Adriatic are dictated by movements of low-pressure area, which causes frequent changes of bora and scirocco (jugo) winds. Annually, Palagruža Island has 104 days with strong (6-7 Bf), and 21 days with stormy winds (>8 Bf). Due to its remote position in the middle of the sea, Palagruža exhibits more Mediterranean climate features than the Croatian coast. Summers are sunny and dry, while most of the rain falls in winter months. There are 2620 sunshine hours annually (1961–1990 average). Annual precipitation level of 304 mm (12.0 in) is the lowest of all Croatia. Maritime winds temper air temperatures compared with the mainland, with average summer daily highs of 26.5 °C (79.7 °F); on the other extreme, winter average daily lows are 8.4 °C (47.1 °F). There are not many types of creatures on this island but the ones that do live there are bright and colourful. Some snakes are venomous but are mostly harmless. ^ Rowlett, Russ. "Lighthouses of Southern Croatia". The Lighthouse Directory. University of North Carolina at Chapel Hill. Retrieved January 15, 2016. ^ "Palàgrūža". Hrvatski jezični portal. Retrieved 3 April 2018. ^ Ostroški, Ljiljana, ed. (December 2015). Statistički ljetopis Republike Hrvatske 2015 [Statistical Yearbook of the Republic of Croatia 2015] (PDF). Statistical Yearbook of the Republic of Croatia (in Croatian and English). 47. Zagreb: Croatian Bureau of Statistics. p. 46. ISSN 1333-3305. Retrieved 27 December 2015. ^ Lorenzo Braccesi (1998). Hesperia 9. L'ERMA di BRETSCHNEIDER. p. 80. ^ Kovačić 1997, pp. 39–40. ^ Gamulin 2000, pp. 1–2. ^ Kovačić 1997, pp. 40–41. ^ Gamulin 2000, p. 1. ^ Forenbaher & Kaiser 1997, p. 15. Babic, K., & E. Rössler (1912) Beobachtungen über die Fauna von Pelagosa. Verhandlungen der kaiserlich-königlichen zoologisch-botanischen Gesellschaft in Wien 62, pp. 220ff. Baric, Daniel (2003) Illyrian heroes, Roman emperors, Greek myths: Appropriations and rejections in Dalmatia under Austrian rule (1815-1918). Research project web outline, section III. Božanić, Joško (February 1984). "Komiška ribarska epopeja" (PDF). Čakavska rič (in Croatian). Split Literary Circle. XI (1–2): 83–180. Retrieved 3 January 2016. Forenbaher, Stašo; Kaiser, Timothy (December 1997). "Palagruža, jadranski moreplovci i njihova industrija na prijelazu iz bakrenog u brončano doba" [Palagruža, the Adriatic mariners and their lithic industry during the Copper Age / Bronze Age transition] (PDF). Opuscula Archaeologica (in Croatian). Department of Archaeology, Faculty of Humanities and Social Sciences, University of Zagreb. 21 (1): 15–28. Retrieved 17 January 2016. Gamulin, Stjepan (2000). "Palagruža, Komiža's fishermen, and fishermen's regatta" (PDF). Croatian Medical Journal. 41 (1): 1–3. Retrieved 3 January 2016. Kaiser, Timothy, and Stašo Forenbaher (1999) Adriatic sailors and stone knappers: Palagruža in the 3rd millennium BC. Antiquity 73 (280), pp. 313–24. Kaiser, Timothy. "Ancient Mariners of the Adriatic: Archaeological Perspectives on Early Navigation". Meet the Professors Lecture Series 2007-2008. Orillia Campus, Lakehead University, Orillia, ON. 11 October 2007. Kovačić, Joško (June 1997). "Palagruža od 12. do 20. stoljeća" (PDF). Prilozi povijesti otoka Hvara (in Croatian). X (1): 39–46. Retrieved 3 January 2016. Montanari, A., et al. (2007) Rediscovering pelagosite. Geophysical Research Abstracts 9. Territori irredenti: L'arcipelago di Pelagosa (anonymous, 2003). "Palagruža". Croatian Encyclopedia (in Croatian). Zagreb: Miroslav Krleža Institute of Lexicography. Retrieved 17 January 2016. Wikimedia Commons has media related to Palagruža.